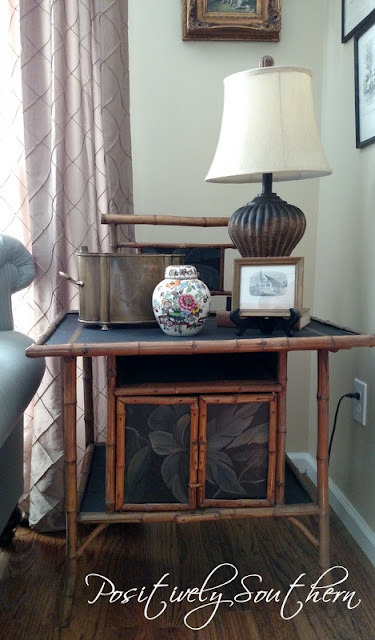 Almost as soon as I started actively antiquing, I fell head over heels for bamboo. 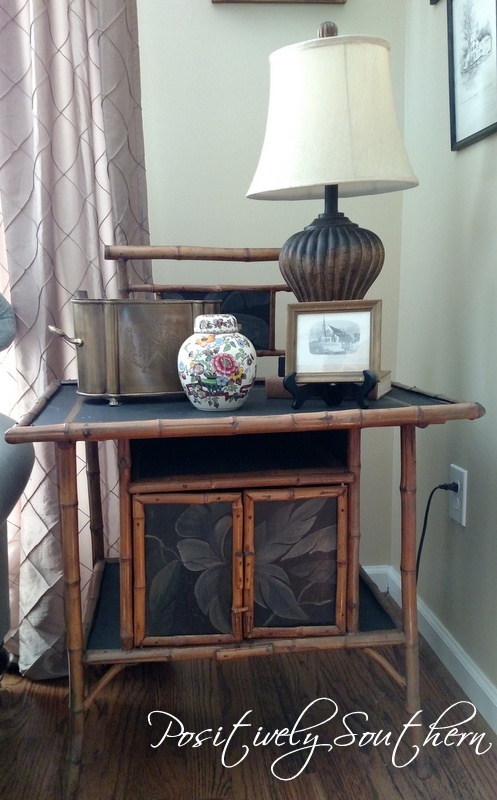 When most think of bamboo I doubt they think of it in an antique point of reference. I'd say most think of it in a tropical locale. The price tag has always been a little on the steep side for any bamboo tables, shelves or mirrors I've come across. Bestie N walks over after I squeal with delight to see what I had found. She looks at the tag and she too can't believe it. The piece is definitely old, just how old I won't ever really know. I'd say the entire table is a somewhat fragile which I think lends to the age of the piece. Neither of us could believe the price and we both believe that possibly the price should really be $350, that surely the vendor has left off the 0. At any rate we pick the table up and promptly take it to the register. There was no doubt that as to where I would put it once we got it home. The table top holds several of my fav things. 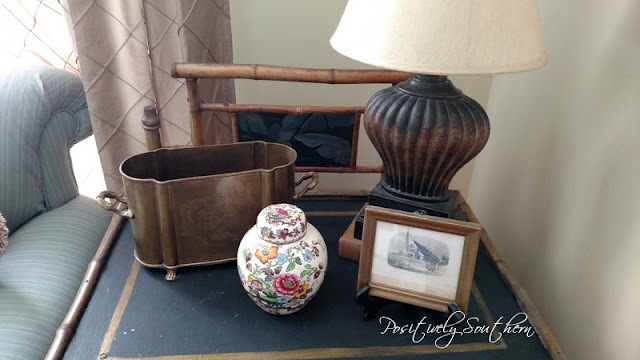 The Masons lidded jar and the small framed print are treasures from England I picked up locally. The lamp has been around forever and the double wine chiller will hold lots of greenery for the upcoming seasons and holidays. So after years of wishing for a bamboo piece I got lucky!!! I'm thrilled with how it fits in the space. What a great find at an unbelievable price!!! I love it! Oh I love it!! 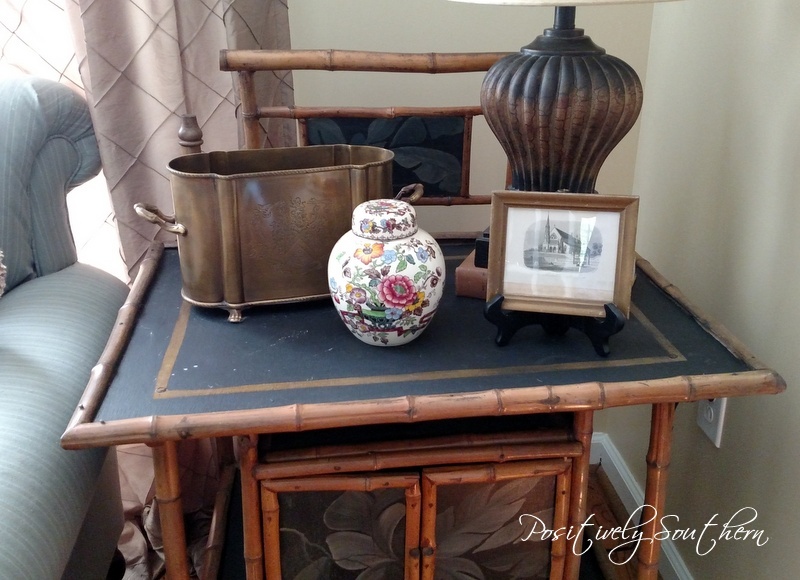 Great find and pretty vignette! Thanks Martina! So enjoyed your Disney recap!!! Sarah, thanks for stopping by! I do love my antiques!!! Glad to find a reader that appreciates them as well!